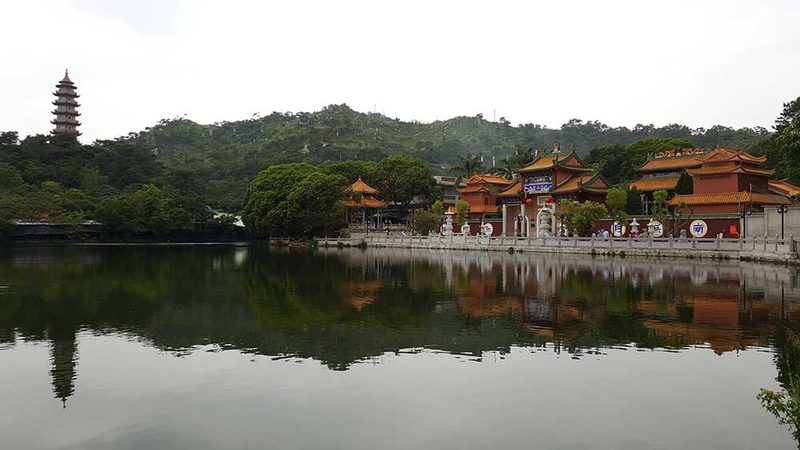 This post was supposed to document our cycle from Shantou all the way to Xiamen: our planned final destination in China. However, it was a very eventful few days, and after only four rides it was clear that I’d need to stop writing and post what I had, otherwise it would be ten pages long. To briefly summarise, it was a very interesting and rewarding ride. It took 6 days and covered 340 km. 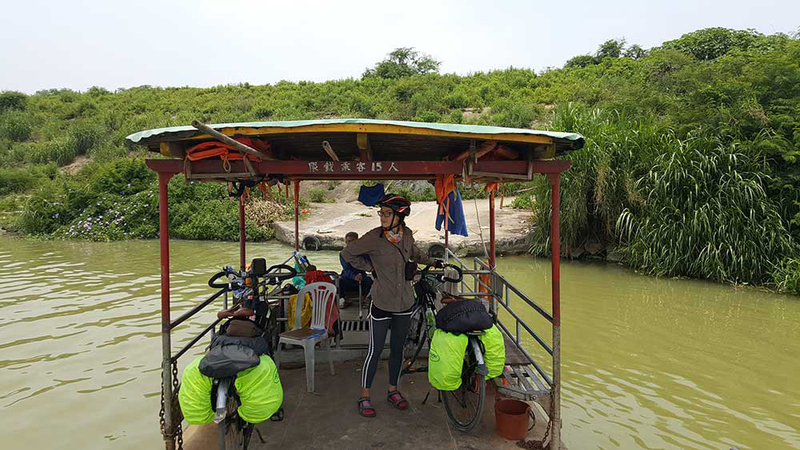 The most direct route between Shantou and Raoping is only something like 50 km, but we decided to do something we’d not done before in our short cycling lives – we went and saw a whole bunch of interesting stuff that took us miles out of the way. And it was totally worth it. First we had to get out of the city and follow a main artery north for about 20 km. This section was dusty and trucky, and best left forgotten. 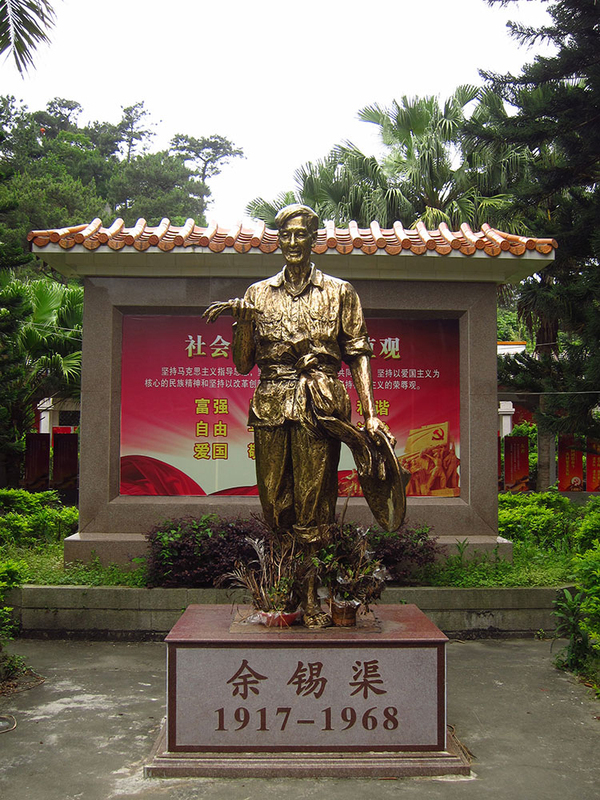 The first stop on our sightseeing list was the only, yes only, Cultural Revolution Museum in China that acknowledges that the Cultural Revolution was a bad thing. There is an excellent story about the museum here which saves me from going into it. It was Wednesday the 18th of May when we visited. 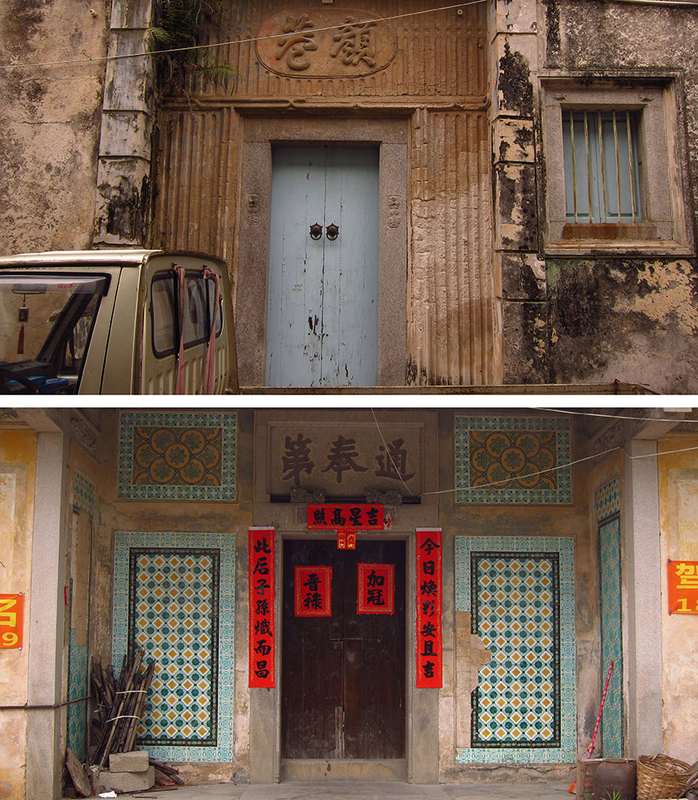 We had noticed that quite a few shops had been closed in Shantou since the preceding Sunday and wondered if there was a public holiday. No, said the internet, it wasn’t a public holiday, but there was a reason that things were so quiet. The Revolution began on the 15th of May, 1966 – exactly 50 years ago. As this article states, the anniversary was met with complete silence by the national media. It was a seemingly perfect time to visit the only museum in the county that openly admits the atrocities of Mao’s leadership. Sadly, the museum was closed for maintenance. We cycled up the steep hill that the museum sits upon, and were applauded in our efforts by a group of local men with big, black-toothed smiles, but it was closed up tight. 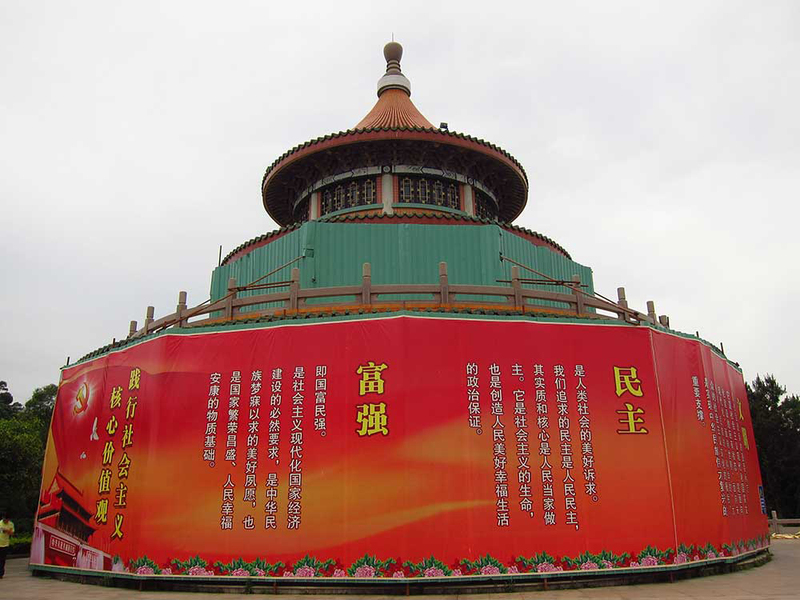 So we wandered around the site for about an hour, checking out the other derelict buildings and a handsome, new pagoda. This is a butterfly, but I don’t know what sort of butterfly. Do you know how difficult it is to identify butterflies? Go on, try it. Go down to the ‘genus’ part of that page and shed a tear for the poor lepidopterists who decided to dedicate their lives to it (yes, I had to look that word up). 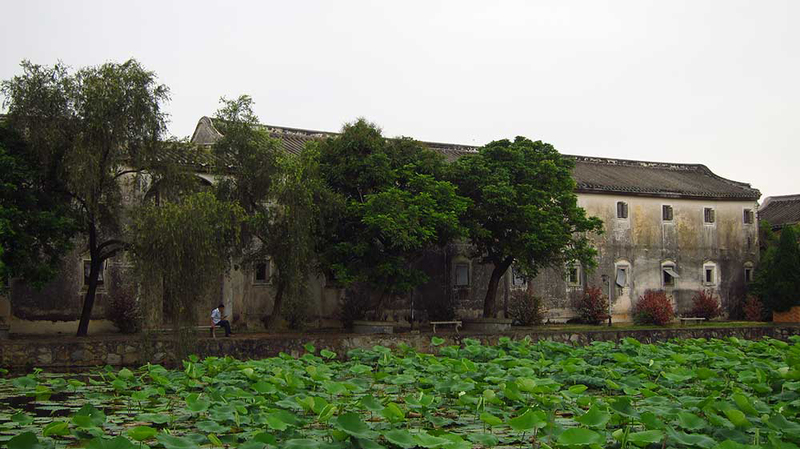 Next, we backtracked a little bit and headed for the old mansion of Chen Ci Hong. 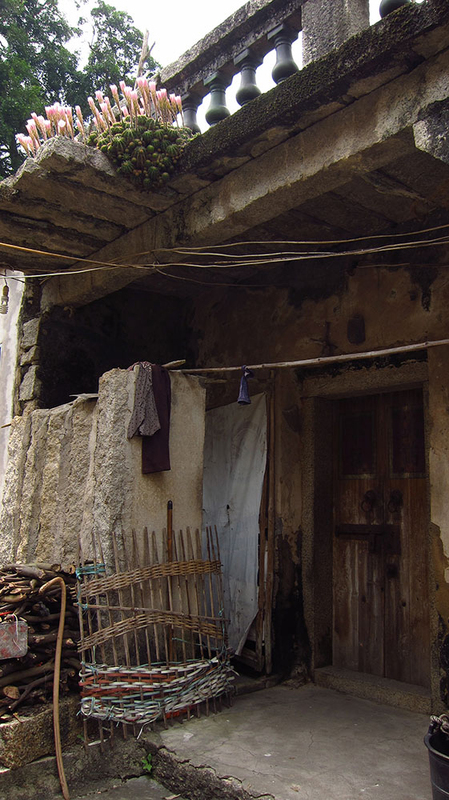 We struggled to find the place, and instead we ended up in a wonderful labyrinth of crumbling, ancient houses. 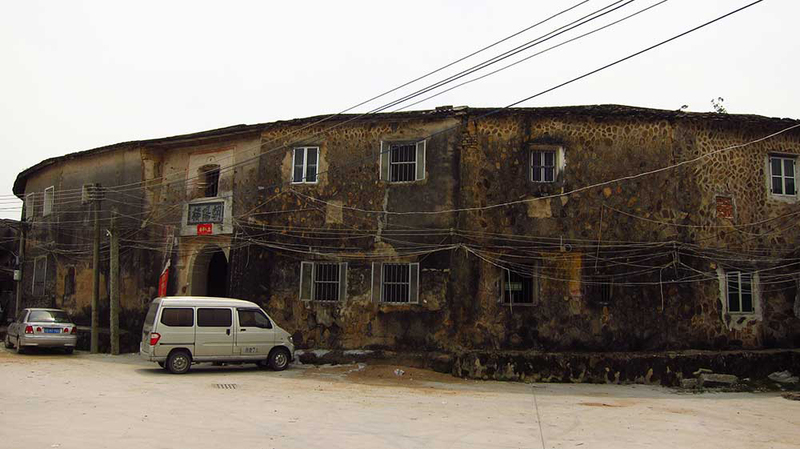 People were still living in these communal ex-mansions, and had filled what should probably be a world heritage site with printing presses, sewing machines, and bags of dried goods. 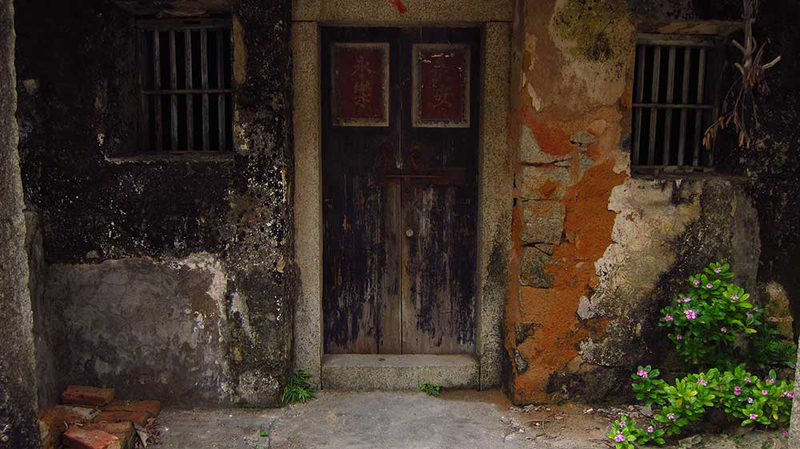 After exploring this unique little place for an hour we realised we were practically next door to the residence of Chen Ci Hong. Checking the time, we decided that if we wanted to visit the next site and still arrive in town before dark we had better push on, so we didn’t end up going inside. 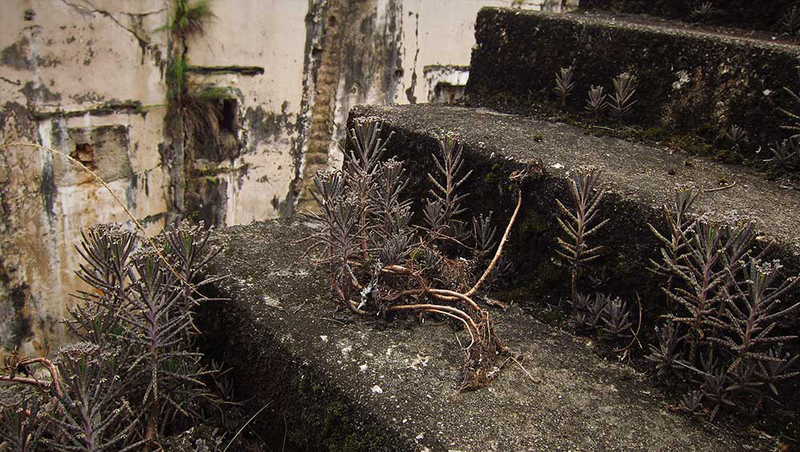 Funny little plants growing from the steps. 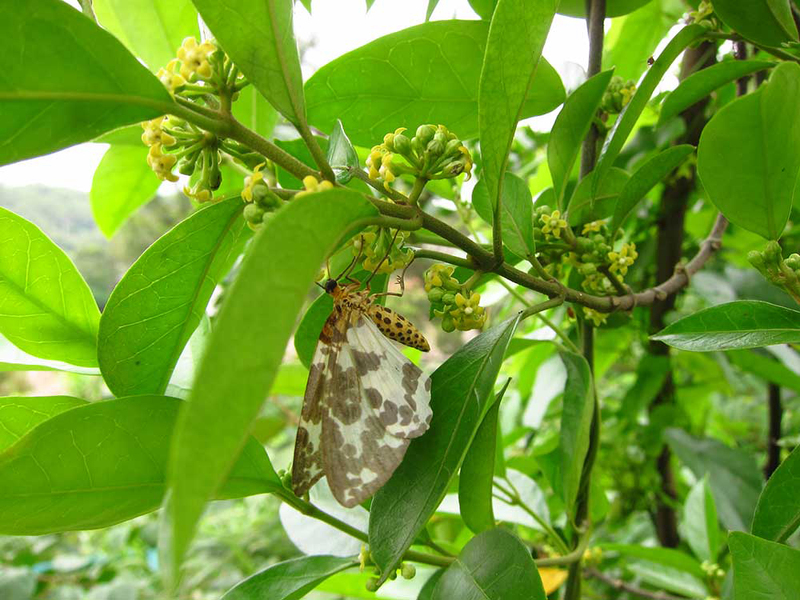 If you want to know what kind of plants they are, see above regarding butterflies. Our third stop was something that wasn’t really an attraction, but another ancient village much like the labyrinth we’d already spent time exploring. 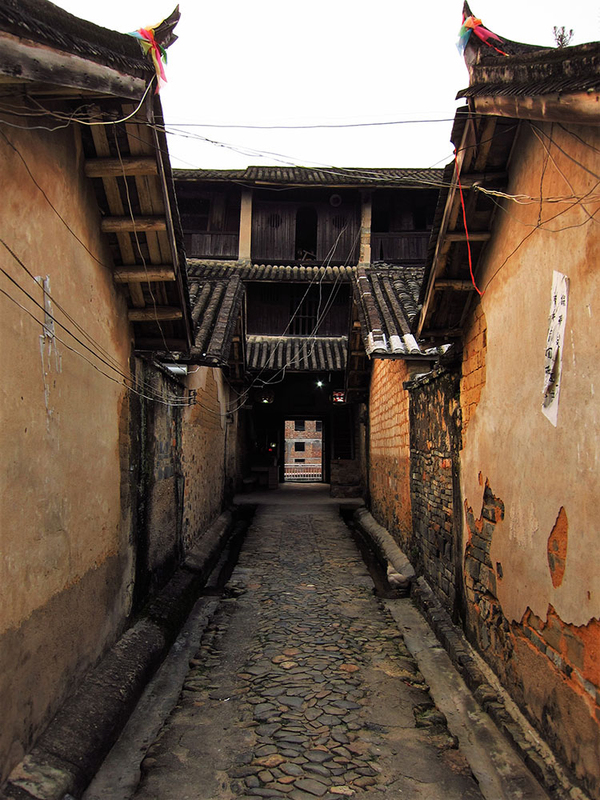 We cycled through narrow alleys and smiled at at surprised locals who stared back in confusion. At one point we hopped off to check the map and a Teo Chew woman on a bike approached us to ask questions. Suddenly two more women were upon us, and they were all very curious as to why we were there. Caroline did her best to reply, and after some exchanges back and forth they suddenly decided we were lost and needed help. The original bicycle woman began excitedly gesturing. As her arms flailed, her voice increased in volume. After ten seconds she was yelling so loud that other people began to take notice, and when she was finished with her explanation she eyed us, satisfied. The other two woman added their two cents, and since we didn’t know how to tell them we actually had a good map and weren’t lost, we wore the grave expressions of people who are thankful for useful advice and pedaled away in the direction they’d pointed. From there we connected with a straight, reasonably quiet sealed highway and powered our way to Raoping. Finding a hotel in our usual price range wasn’t easy, and after cycling all over the town for about two hours we finally came across one that, while still more expensive than normal, was the cheapest we could find. The extra expense was evident when we walked in, and so we spent our evening in relative luxury leaving only to eat fried noodles. The most direct route between Raoping and Sanrao is 49 km, but this time we didn’t choose to explore other areas – we just kind of got a bit lost. On our trusty navigator Google Maps, there were two different routes we could choose. One was up the main highway, and the other was a smaller road that ran along a river and joined up with the highway after 30 km. Easy choice, right? We followed the river road, and it was lovely. Soon it became a compacted dirt road and it was still lovely. Then it became a very overgrown and rocky road which was still lovely, but also mildly disconcerting when the bamboo branches would slam into our faces. Soon the road passed under a train bridge which was also a goose farm. Then the road became a very narrow goat track through a banana plantation. Eventually it began to feel like we were in somebody’s property, and so we turned a different way only to discover that our map was at odds with everything around us, and the magical blue GPS dot decided we were in the centre of a mountain. After a small debate we decided to turn back. The main highway that we wanted to reach was close enough to our location, but there was a river in between us. The only bridge was all the way back where we started from. Luckily for us, just back beyond the under bridge goose farm, there was a boat man. When he wasn’t asleep, he was selling rides over the river for 3 yuan per person. We woke him up with a loud click of the bike stand, and his look of astonishment mixed with happiness didn’t leave his face until we were cycling off on the other side. We finally met up with the highway and rode towards the shimmering heat waves. During this particularly hot ride, two saints in a truck pulled over and handed us four bottles of water. They asked about our travels, and then drove away giving us thumbs up. Soon we stopped for a cool tea, and the woman who ran the shop sat with us and asked as many questions as we could answer, marveling at the distance we’d come. After cycling through the big cities in the Gunagdong Province, I had almost forgotten how nice the people in rural China were. These random, happy encounters lifted our spirits. 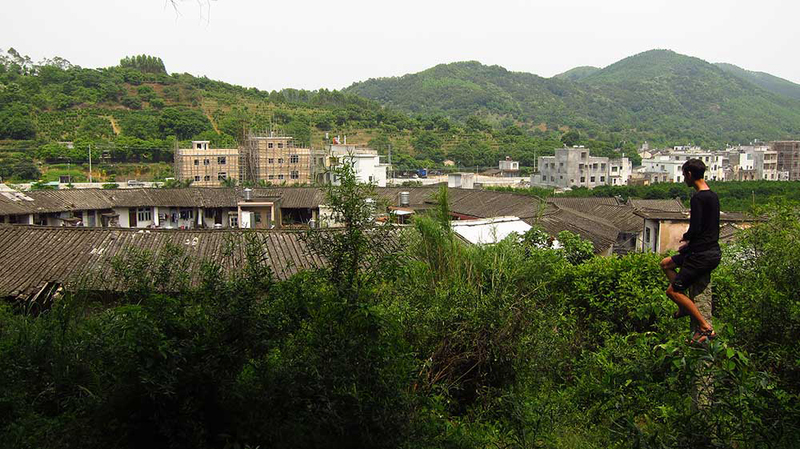 As we rode, I noticed one the of the famous tulou houses in the distance. 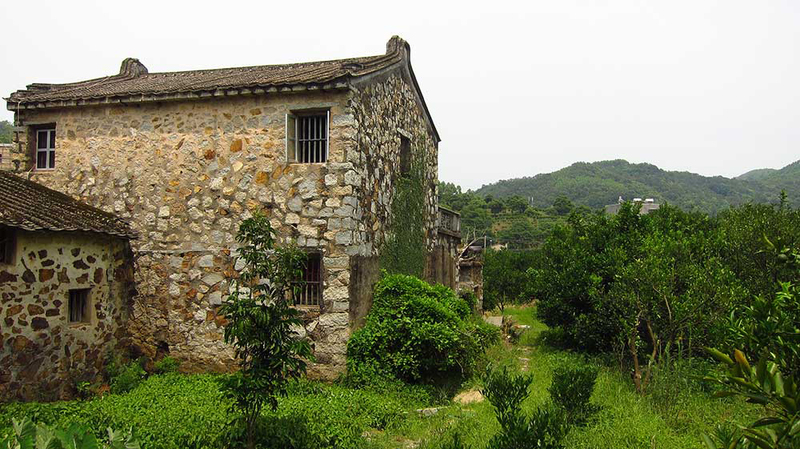 These earthen, communal, ring shaped houses are famed in the Fujian province and can occasionally be found in the surrounding provinces too. 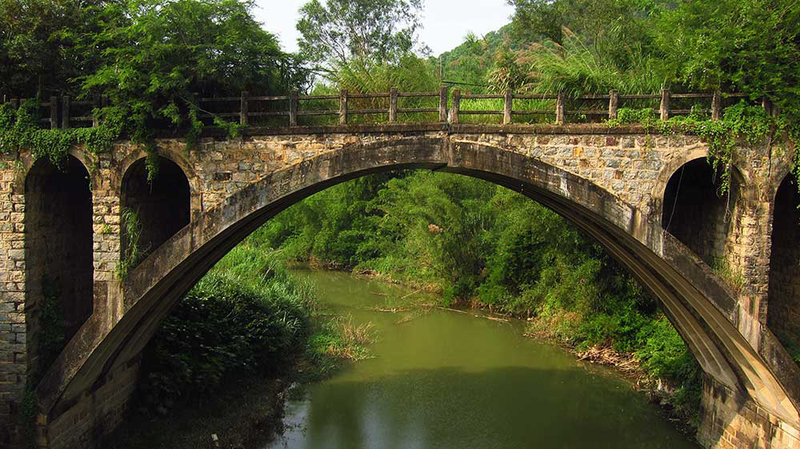 We were very close to the border of Fujian, and this was the first one we’d seen, so naturally we were very excited about seeing one ‘in the wild’. 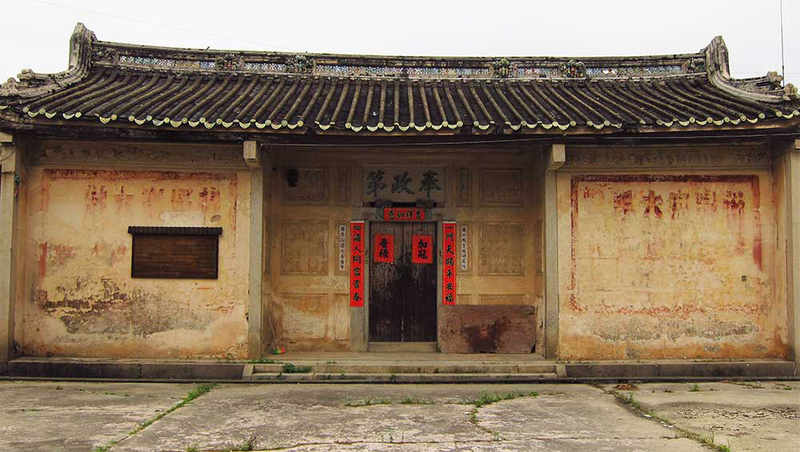 We pulled up the little village of Xinlou and walked around the exterior of the old, circular building at its heart. 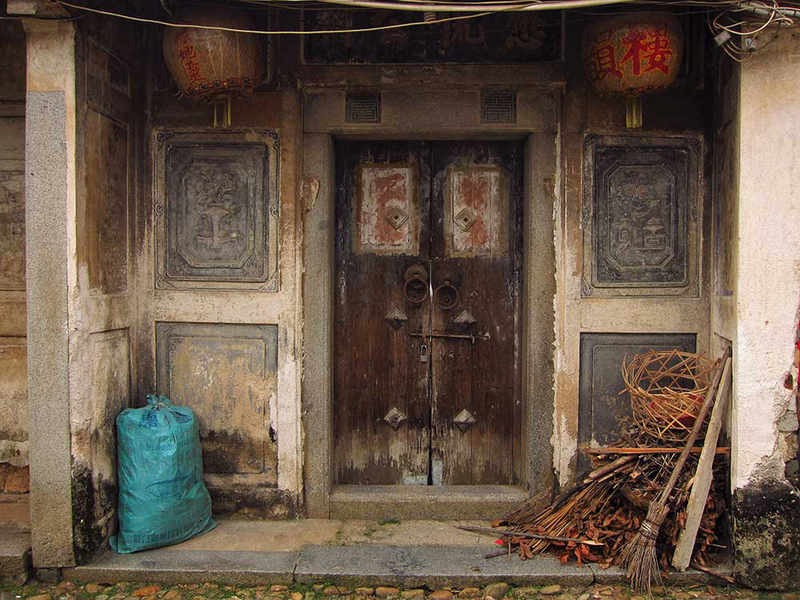 The front of the tulou had power cables and fuse boxes, but in some parts around the rear there was nothing at all that could be considered modern; everything would have sat the same way for hundreds of years. I wanted to get a photo from above, and there was a small hill behind the complex. We climbed it and I found a concrete pole to perch myself on. And the photo I took from my pole. A nice little cactus growth in the roof. 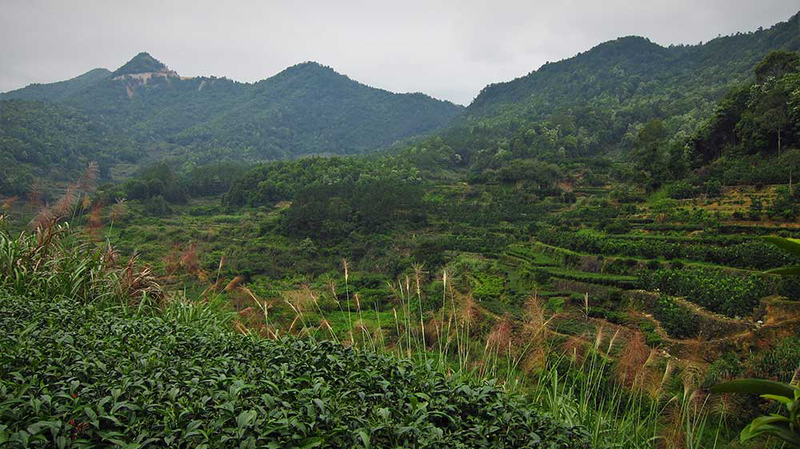 The rest of the road took us past the huge, stunning Tangxi Reservoir with its ex-hilltop islands. It snaked around tree-covered mountains, giving us a couple of challenging climbs and plenty of beautiful scenery. The final descent into town bought us back to the medium sized chaos of vegetable markets and school kids, and it took us over an hour to find any hotel. Eventually, by sheer chance, Caroline peered down an alley and discovered the most unexpected thing in this industrial town: a fancy hotel. 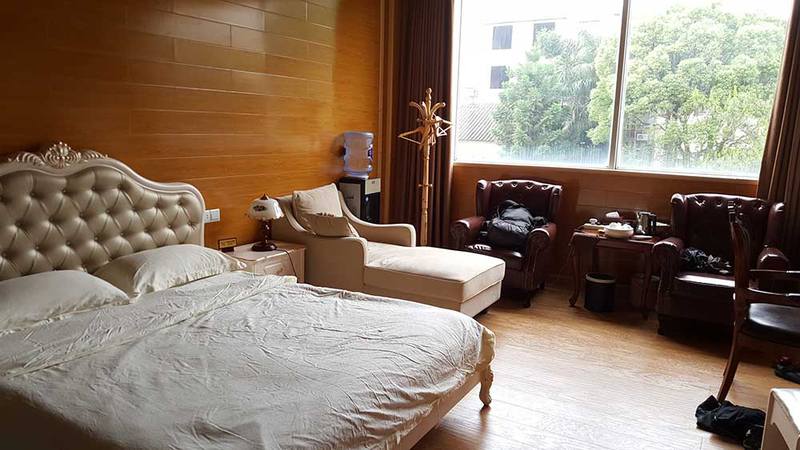 It was 200 Yuan, more than double what we usually try to spend, but it was so ridiculously luxurious that the price didn’t matter. And anyway, I’m pretty sure it’s the only hotel in all of Sanrao. 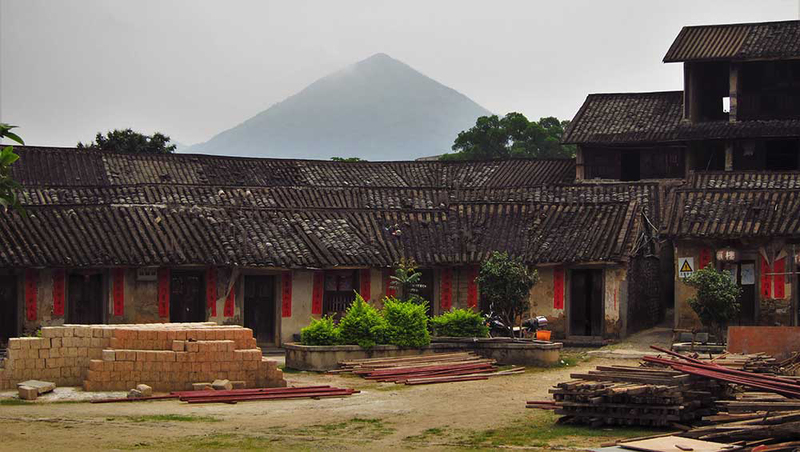 Sanrao is the home of Daoyun Lou, the largest tulou house in China, and so very likely the largest tulou house in the entire universe. After we packed our gear and left our haven of luxury, we went to visit this beautiful, crumbling doughnut. A man seemed to be waiting for us when we arrived. “Do you have WeChat?” He pulled out his phone and began flashing a QR code at us. Back before leaving for this trip I was in a band, and one day we were designing posters or business cards or something. Whatever it was, I suggested we use a QR code and was met the sort of harrumphs normally reserved for Luddites. Nobody uses QR codes anymore, I was told. QR codes were a strange fad that never really caught on and made the NZSO posters look ugly. The matter was dropped. Now, here in China, they were everywhere. They connected phones to Wifi. They turned strangers into WeChat friends. They were on café walls and hotel lobbies. So screw you all, I’m still hip in China. And so after we became WeChat friends with this man (as of this writing we have not once contacted him), he showed us around the tulou and told us about his life. He’d just come back from Dubai. Something about running a small tailoring empire and fishing business out of the local stagnant pond. The details were vague, but he was friendly enough. He took us to the centre of the inner courtyard and pointed up to the outermost ring. The rooms were about to collapse and he told us that nobody could go up there. 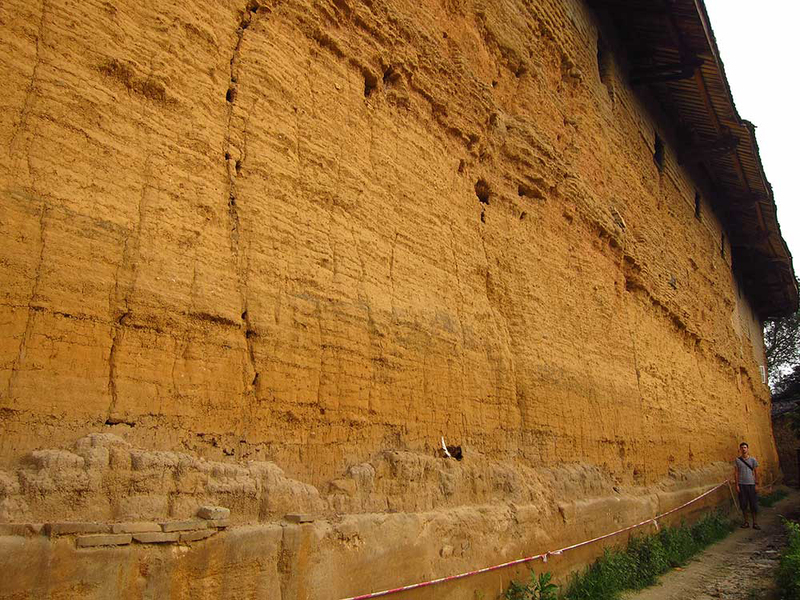 Ten years ago, he said, people could explore the site, but since then large chunks had begun to fall away. A few people still lived inside the inner ring, but it didn’t look like a tourism destination anymore. 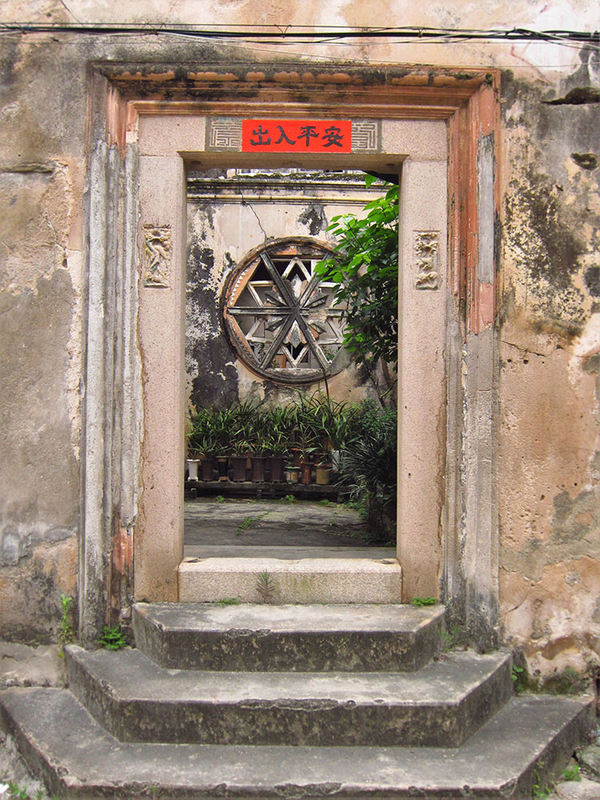 The entrance of Daoyun Lou. No charge of course. 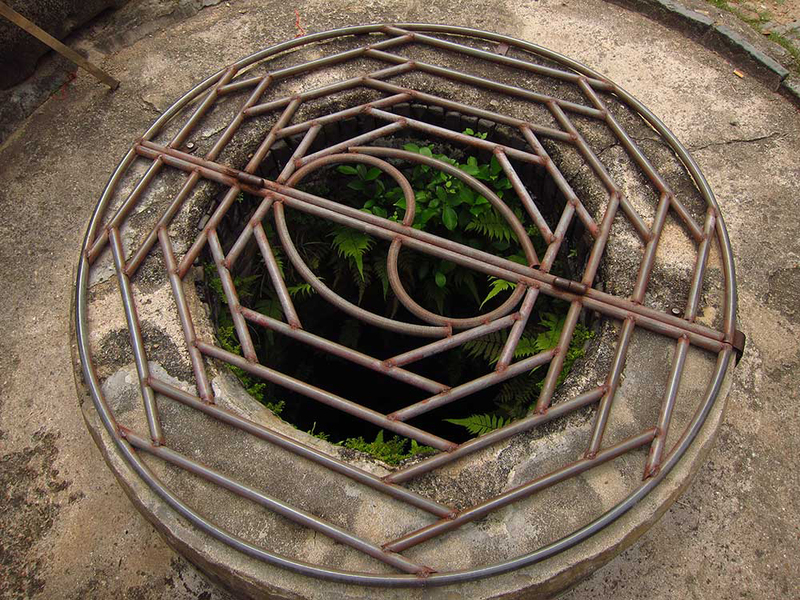 One of three wells inside. “No longer used,” our friend told us. If you can read all of this, just think of the things you’ll learn! 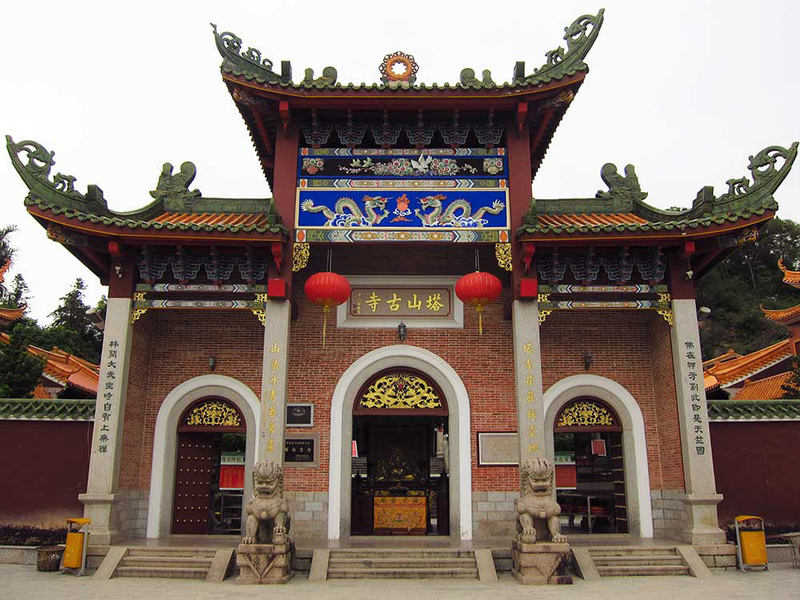 We planned on traveling as far as Jiufeng which was only 45 km away, but when we arrived we couldn’t find anywhere to stay. We sat down at a little sweet milk tea shop and talked about what to do. While we decided, countless teenagers in school uniforms noticed us, tugged on their friend’s shoulders, then smiled or looked in amazement at us. The town was slightly off the main road, and it was unlikely that many outsiders would ever feel the need to pass through. 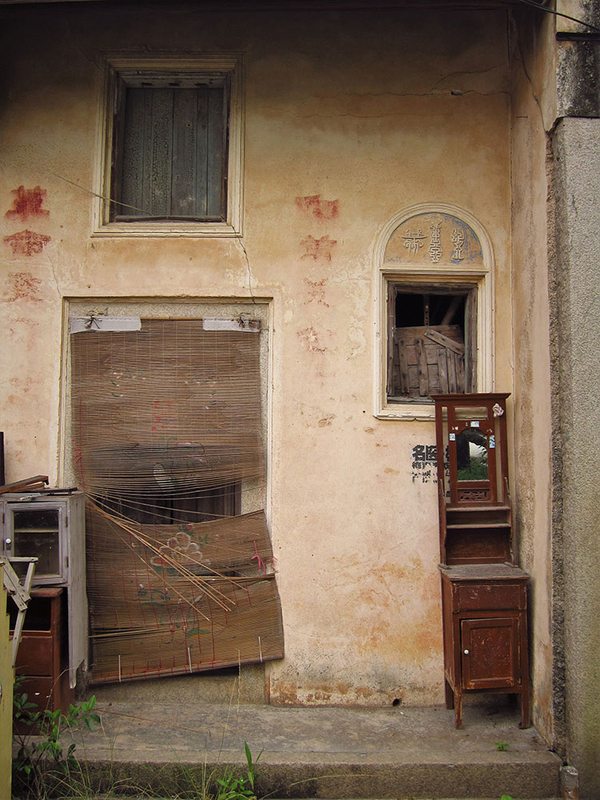 “This is what I imagined China to be like,” said Caroline, and I agreed. The village was something special. 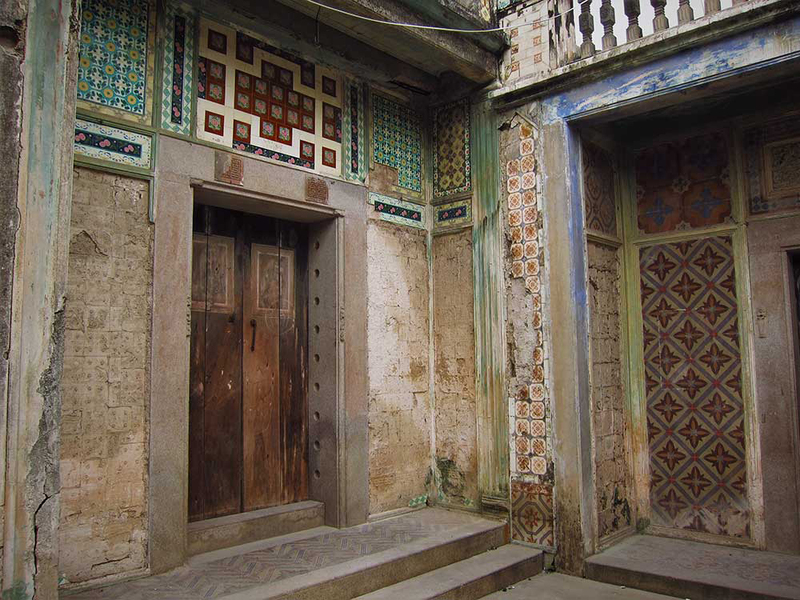 Many of the houses were the earthen, ornate community homes and temples built hundreds of years ago. We had decided to carry on cycling for a further 45 km, and as we snaked slowly through the narrow streets, we kept on exclaiming at how beautiful it all was. 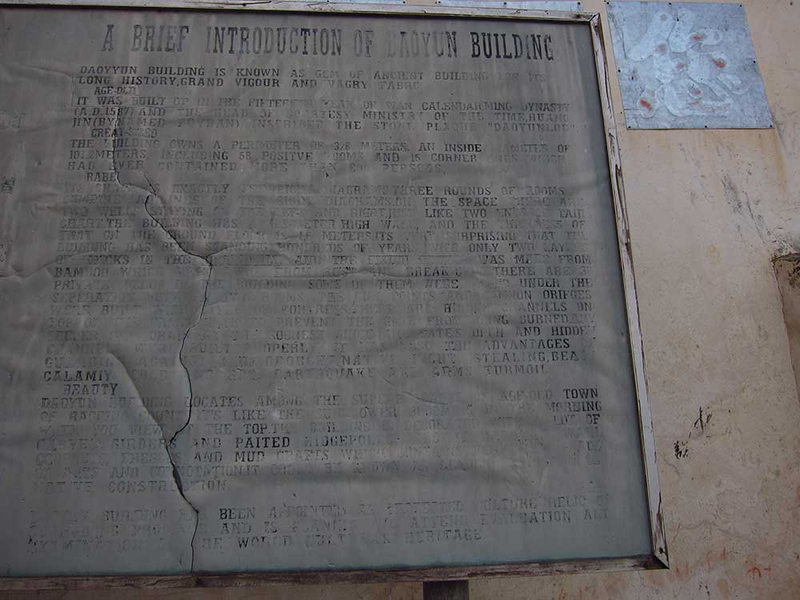 Of course, where the old, ornate structures had crumbled away completely, modern building had replaced them. They were brick cubes covered in grey cement with square, front facing windows. Function over form. The ride was difficult and mountainous, but that brought with it a calmness and beauty. When we were riding our motorbike through Vietnam we found ourselves in many lonely places like this, but there was always the roar (or whatever you’d call the sound that a crappy engine makes) cutting through the stillness . On our bicycles we could hear the birds, the waterfalls, and the calls of farmers high in the hills tending to endless rows of pomelo trees. Our sweaty climbs were rewarded with what our friend Brent described in a comment on this blog as ‘cycling heaven,’ with large downhill expanses – not so steep that we had to hold the brakes on, but steep enough to feel the rush of wind and to necessitate us having faith that the bikes wouldn’t suddenly fall to bits. 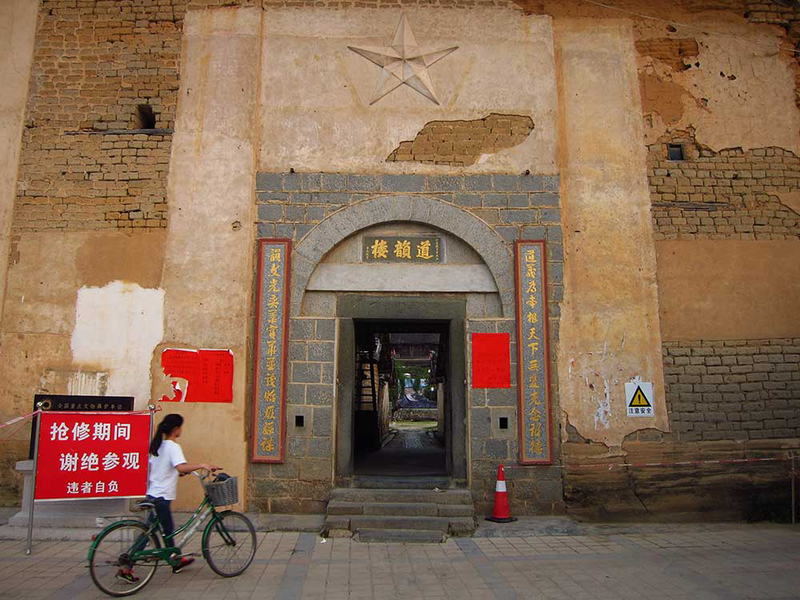 This day was a milestone of sorts; we left the Guangdong Province behind and entered the Fujian Province, crossing the invisible border created when the Ming Dynasty upped China’s provinces from 10 to 15 somewhere between the 13th and 16th centuries. There you go. Have some history. 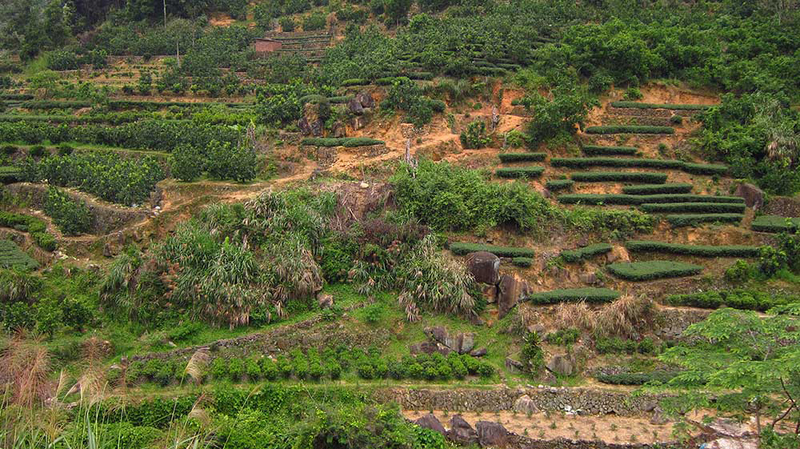 Instead of the usual monocrops, the hills here contained all sorts of fruits and teas. It wasn’t quite pomelo season. Pinghe was a surprisingly peaceful city. It was well maintained and had just the right amount of bustle to give it a good energy without being overbearing and pushy. 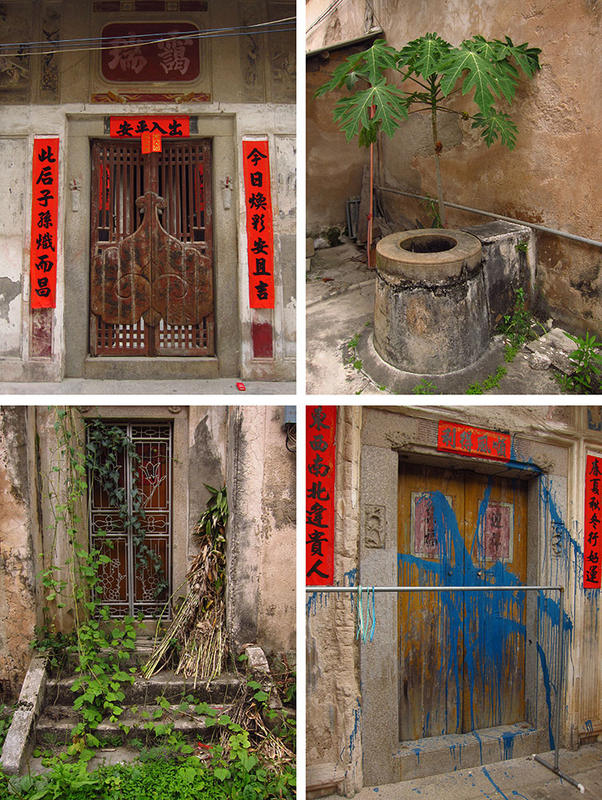 It was a city proud of its fruit-growing, right down to the pomelo-shaped street lights. We spent a couple of nights in a much cheaper hotel than our last two, but it had wall-to-wall corner windows that looked out over three separate streets. On our day off it rained constantly and so we mostly stayed inside, washing clothes and relaxing. I did a little online work for my old work back home, and we drank a lot of the free tea that comes with hotels in China. 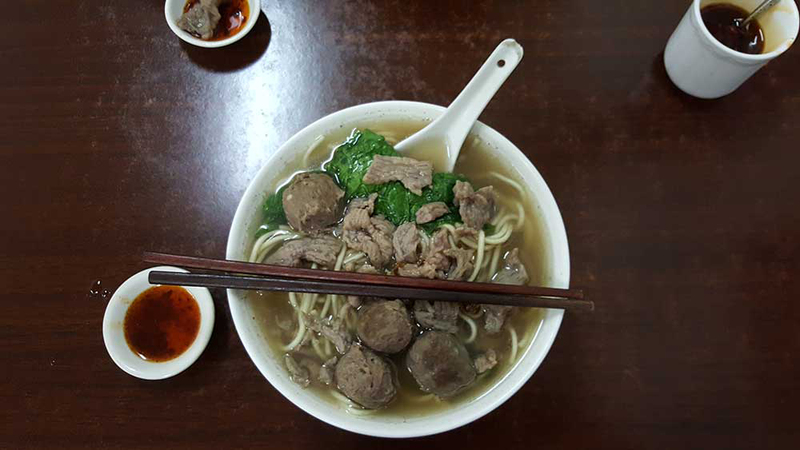 One of the common dishes in this part of China: beef ball noodle soup. In keeping with the theme of this particular blog post, we added an unnecessary extra 12 km onto this ride – and Google maps is to blame. The ride began with about 20 km of backtracking from the day before. This was completely fine, it was part of the plan, and staying in Pinghe was so nice and relaxing that it was definitely worth cycling back over old ground again. The scenery seems different when you’re approaching it from the other way, but things also incline differently; yesterday’s 20 km of mostly downhill cycling became today’s 20 km of most uphill cycling. Added into the mix were brief bursts of rain and sun which made the temperature confusingly humid. Confusing because we didn’t quite know whether or not to wear rain coats. There were two possible turnoffs: the closest one which was recommended on Google Maps, and a farther one which wasn’t. The very real worry of following the closer turnoff was that it was what we call an ‘x’ road. Sometimes these roads actually have an x in them followed by a string of numbers, and sometimes they aren’t even labelled. This particular one wasn’t labelled which should have been our first warning sign. The other, further-away road was clearly the main highway. A safe road. So of course, we took the shorter ‘x’ road and ended up climbing a steep footpath through a pomelo plantation reaching a total dead end. Right where the map said there’d be a road, there was a hill covered in pomelo trees. The annoying thing was that we were so close to the highway we needed to meet up with; it was only 2 km away. But alas, a hill of unripe fruit completely blocked our path, and so, swearing, we rode all the way back to the turnoff and carried on through the longer, safer way. On Google maps, if you switch to ‘terrain’ mode and look over the area we cycled, it looks like somebody crushed a sheet of tin foil into a ball and then quickly spread it out again without smoothing it. We were definitely in mountain country now. 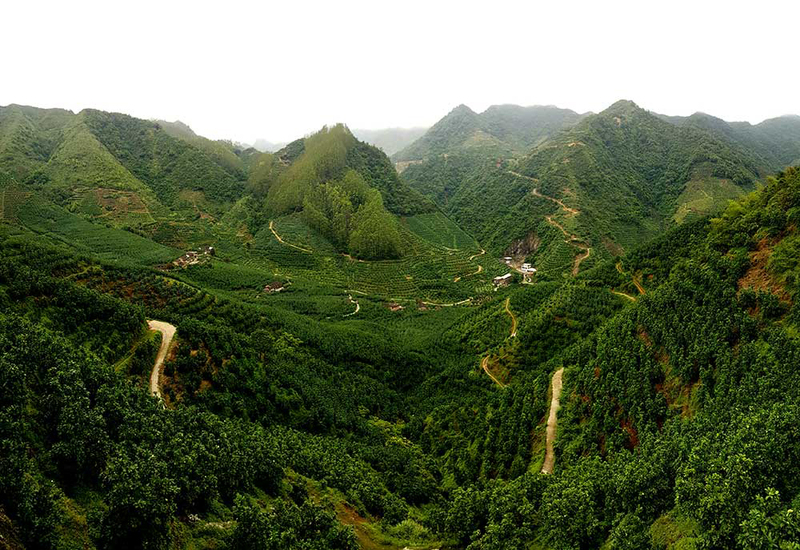 This terrain brought with it some challenging rides, but it also meant very few cars and absolutely gorgeous scenes of valleys filled with tea and pomelo. 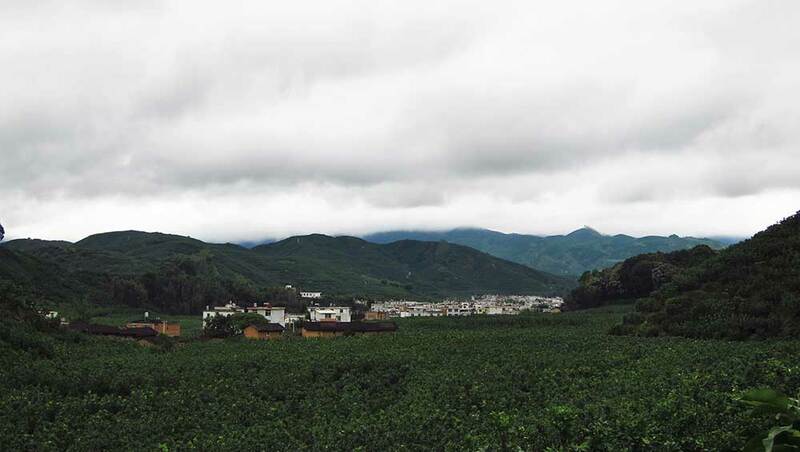 The Fujian Province, one of the smallest provinces in China (half the size of New Zealand but with eight times the population), is the highest exporter of pomelos in the country according to this yawn-inspiring report. Much more interesting than an export report is a view like this. Halfway up the second large mountain of the day, the skies decided to open and unleash a torrent upon us. We slowly rode up through the steadily increasing road rivers. Riding up through road rivers is an interesting phenomenon: they produce a strange optical illusion that makes you think you’re actually going faster than you are. Brown waterfalls had formed at various intervals and added drama to the scene. The inevitable downhill was slower than normal because the droplets were blinding me and the humidity was fogging up Caroline’s glasses. 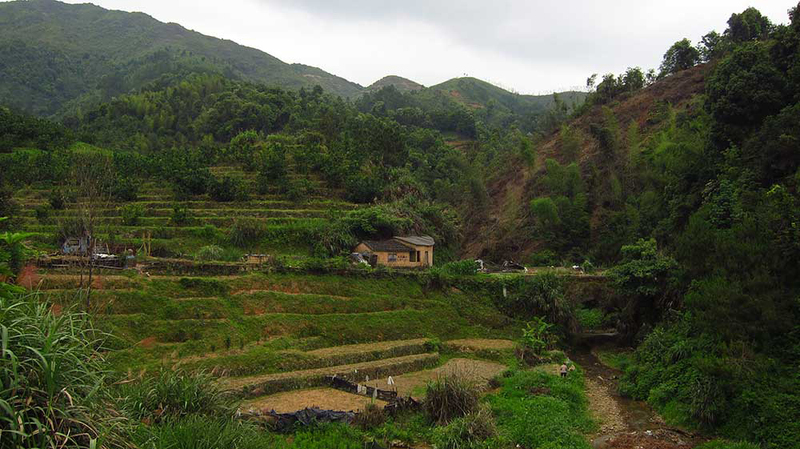 On this final descent we passed many tulou houses. 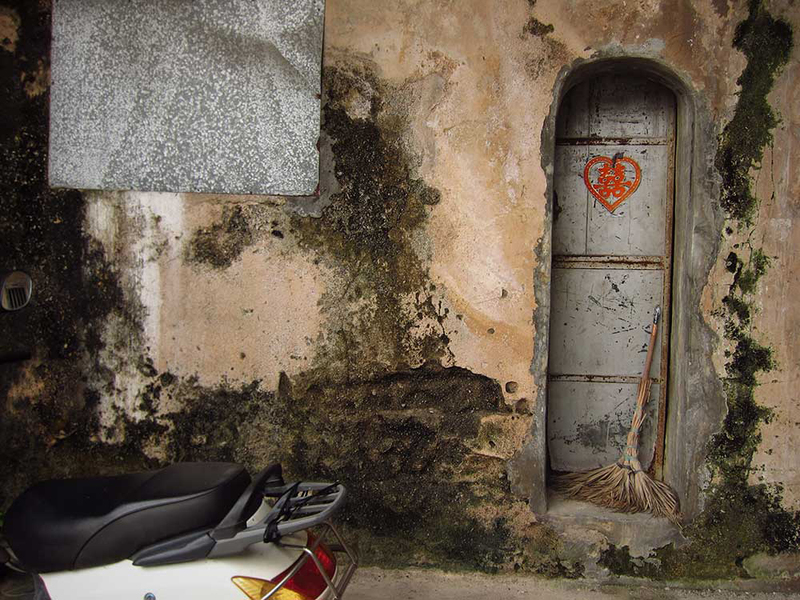 Some were crumbling away, and some had been maintained or even spruced up for tourists. When we reached Hukeng it was still pouring with rain. We had pre-booked a cheap hotel but the address in the confirmation email had been vague. 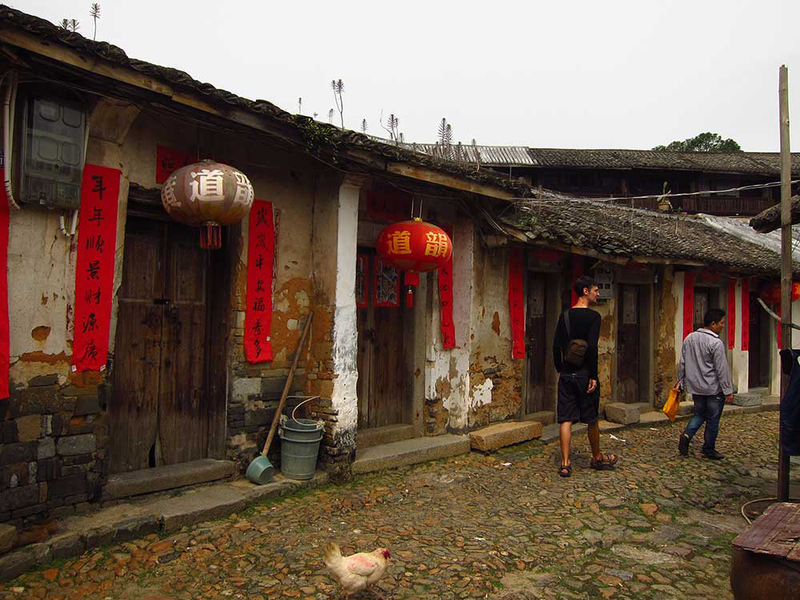 After cycling around the town and asking a few people, one of them finally told us that the hotel was actually in the Fujian Tulou Kejia Folk Culture Village which was 3 km away. That same person gave us a grave look; we were bedraggled. He invited us into his hotel which moonlighted as a tea shop. He gave us a towel each and began to pour countless cups of tea while we watched his tea preparation. At any point during the half hour we spent with him he would be either turning on a little tap which filled a kettle with the correct amount of water, boiling the kettle, preparing tea leaves in a lidded pot, rinsing the leaves and pouring the water into a hole in his ornate wooden table which led through a tube to a bucket underneath, filling the lidded pot, pouring the steeped tea into a glass pouring vessel, or filling up our cups using the glass pouring vessel. All this was thoughtlessly done on a steady rotation while we chatted using various translation apps. Then silence while we thought of things to type. The tea is delicious. It tastes buttery. After saying our goodbyes we cycled the final few km to the cultural village. 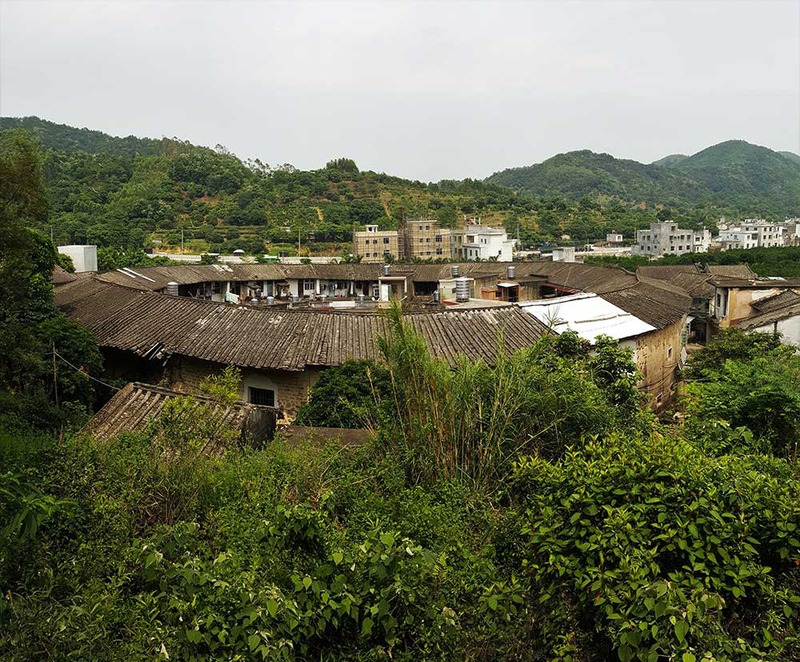 It was a tourist attraction: a large, gated village filled with earthen huts, temples and tulou houses. When we arrived we learned that our cheap hotel was actually inside the compound, and we had to pay an entry fee to get to it. This is not exactly what we wanted to hear in our wet, tired state, but of course we paid and finally found the hotel just as darkness was approaching. This post has gone on long enough. I do have plenty of things to write about the hotel and the cultural village itself. We ended up spending three days there and it was so interesting that it really deserves its own post. Well what do you know? That post has now been written. That last picture was taken from the cycle tourists afterlife where we can create our own reality, I am sure :-). Cycling Heaven found again! Yeah man, totally. I feel like I’m glossing through so much when I write these posts, and they still end up kind of long. Ha! 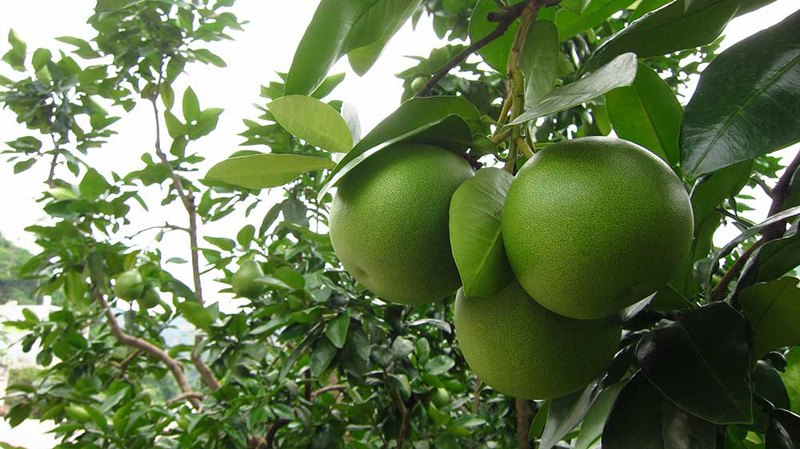 That last photo was of the pomelo grove we accidentally ended up in. It didn’t feel like heaven at the time, but it is beautiful in hindsight. Yes indeed. 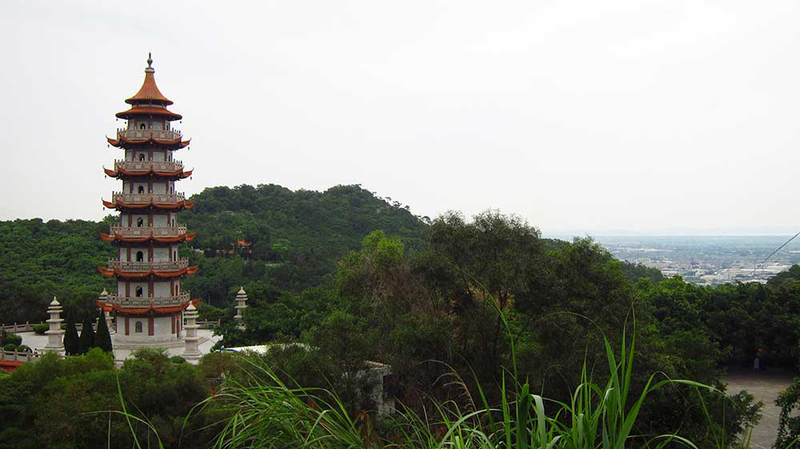 Once we reach Xiamen we’ll be taking a ferry to Taiwan and cycling around it too. But only after a good, long rest. Wait. That photo wasn’t of the grove we got lost in, sorry, it was just up near a tunnel that mercifully cut through some mountain. And yes, heavenly. I love this description. Keep up the good work! As someone who bike commutes to work everyday, and is in fairly good shape, I can’t believe the distances you guys are covering. You’re truly some badass travelers! As someone whose entire cycling experience was commuting to work before this massive cycle in China, and who wasn’t exactly very fit, I’m sure anybody with the mind to do so could also cross those mountains.